Having issues with your hot water and need emergency plumbers in Rockingham? Having problems with your hot water system? Need to upgrade? No problem, our experienced and licensed plumbers in Rockingham are available 24 hours a day, 7 days a week to install your new hot water system. We will also remove your old unit at no extra cost! We will discuss the various options available to you, including brands, capacity, price range and energy efficiency rating, providing advice and assistance at every step of the decision making process, ensuring the system you choose meets the exact needs of your home or business. As Waterwise Plumbers in Rockingham, we care about our environment and promote the use of only the most energy efficient products. Choosing to conserve energy and increase your efficiency not only helps the environment but also saves you money. Over the past 6 years, Western Australia has seen steep increases in gas and electricity prices and it has been suggested that prices will continue to increase. In fact, since 2009, the cost of electricity in Western Australia has increased by a massive 64%! Now has never been a more appropriate time to carefully consider the environmental impact and energy consumption of the products we use. Check out our Guide to Choosing the Right Hot Water System for a comparative breakdown of the estimated annual greenhouse gas emissions produced by each type of hot water system. Choosing a water heater that is right for you and your family depends on a number of things. For instance, what energy sources do you have available? Do you have access to electricity and natural gas? Are you interested in reducing your carbon footprint and so are looking at making the switch to solar or heat pump? What is your budget? After deciding on the type of system you would prefer, you need to figure out the size of the unit you need. How big is your household? How many showers does each person have per day and what are their average shower times? When do you use your hot water. Peak or off peak? Do you use a low flow shower head or a standard one? Where is your current water heater located? 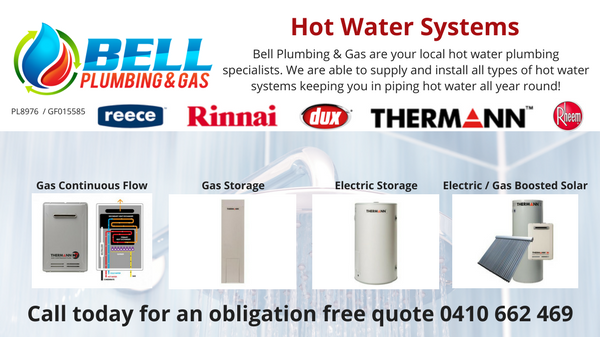 As hot water plumbers in Rockingham, Bell Plumbing & Gas know how hard choosing the right hot water system can be. We have therefore decided to take the headache out of the process for you by compiling a brief guide to choosing the right system for you and your family. Lastly you will find a step by step guide taking you through the whole process, from determining your level of hot water usage to choosing the right system for your needs and having it installed by a licensed emergency plumber in Rockingham. If you are still unsure and are looking for more advice, don't worry. 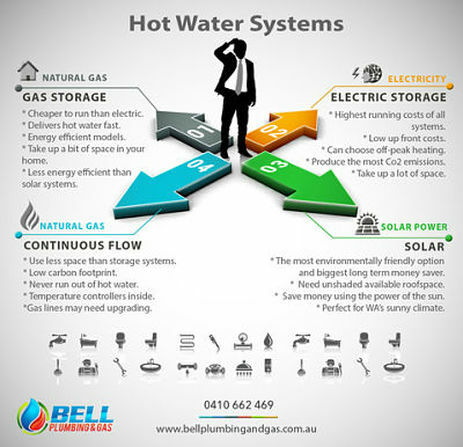 Just call Bell Plumbing & Gas Rockingham on 0410 662 469 and we will be happy to speak with you and provide support on choosing the right hot water system based on your individual needs. Are you using renewable or grid electricity? Electric storage hot water systems have the highest running costs and produce the most Co2 emissions. The storage cylinders can take up a fair amount of space in your home. You may save on installation costs when replacing a like for like system. You can choose an off-peak heating tariff. Upfront costs are low but running costs add up over the years. Mounted on wall so take up less space than storage systems. Produce less Co2 emissions than storage systems. You will never run out of hot water, with water being heated on demand. Controllers installed inside your home to enable adjustment to temperature. Gas lines may need to be upgraded if swapping over from a storage system. Heat Pumps have a smaller carbon footprint than electric storage systems. Relatively easy to install if changing over from an electric storage system. Heat Pumps are suited to warmer climates making them perfect for sunny Western Australia. They rank third when it comes to cheap running costs. Heat Pumps need adequate airflow. They can be a little noisy when running. You will reduce your energy costs by using the power of the sun to heat your water. Perfect enviro-friendly option for Western Australia's sunny climate. You will need unshaded roof space available. Electric boost to help on rainy days. High upfront costs but far cheaper to run than electric storage. Cheaper to run than electric storage hot water systems. If your home is not connected to gas you can still take advantage by choosing a gas heater connected to an LPG bottle. The storage cylinders can take up a bit of space in your home. Less energy efficient than gas boosted solar hot water systems. By far the cheapest to run and most environmentally friendly system on the market. Perfect for WA's sunny climate and abundant natural gas supply. Gas boost provides additional heating on rainy days. North facing roof space optimal for this system. Higher upfront costs than other options.